Race 1: 3YO Fillies Plate 1100m. Hard to see that any horse will be a more deserving winner all day than CRACK THE CODE (1st). She had to sit three-wide without cover up on the speed throughout and was still way too strong through to the line. Notes: NEWS GIRL (2nd) was a little slowly away but had enough speed to kick through and lead. She only wen under in the last few strides and was good in defeat. EMBRACE ME (3rd) had he soft run in behind the leader before angling clear and having every chance. THINE IS POWER (unplaced) made a nice return to the racetrack, she had the nice run behind the winner, loomed but just may have run out of condition late. COSMIC RUBY (unplaced) had every chance after sitting outside the leader. Race 2: Fillies and Mares Handicap 1100m. Notes: MISS NORWAY (1st) was a scratching from Friday night’s Moonee Valley meeting and the connections were rewarded with an all-the-way win here. She jumped well from the gate and got straight on the bunny, dictated terms and rolled along under her own seam, railed well into the straight and never looked in danger. QUEEN ANNABEL (2nd) was solid from the back making up good ground but didn’t really ever look like running past the winner, BELLARIA (3rd) was ok resuming but had every chance after landing in the box seat. TIARA STAR (unplaced) had every chance after landing in the spot 2nd, effectively outside the leader, but was the first beaten. Race 3: BM78 Handicap 1400m. GROUNDBREAK (unplaced) was a tough watch for those that invested in the 5/2 being offered. He was only fairly away before settling mid-field two-wide, was crowded and then hassled by another runner before charging home late. No doubt he should have won. Notes: The first two across the line were the first two in the run, and it seemed that race fitness was the difference. SIMPLY INVINCIBLE (2nd) sat outside the leader and winner, loomed up to win and actually got past that horse before running out of condition late. CRITICAL THINKING (1st) was that leader, kicked through on the rails and when they turned for home, was really under pressure. He was headed but rallied under the urgings of Mick Walker to kick back and win by a half head. INDIAN THUNDER (3rd) settled well back, saved ground and was well ridden to run on into third. OCEAN DEEP (unplaced) had every chance and was very disappointing. 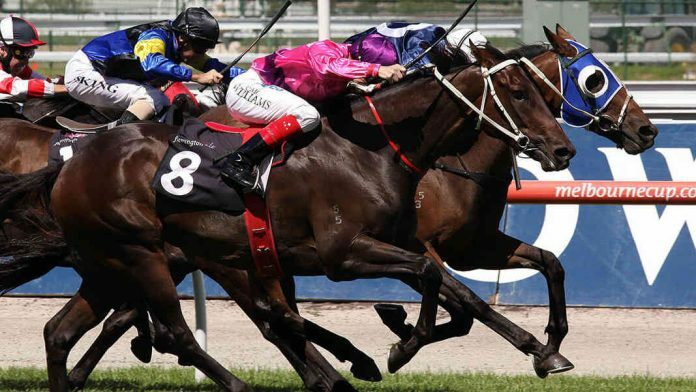 Race 4: Blue Diamond Preview 1100m Colts and Geldings. Notes: As is usually the case with these summer 2YO evens, pure speed is the main ingredient. I AM IMMORTAL (1st) jumped well, got the front as he liked, railed into the straight and never really looked in any danger of being run down. MICROPHONE (2nd) settled second and was outside the winner, just lost a little ground at the top of het straight before rallying and coming again late. AUXIN (unplaced) looks like he still has a few things to learn, he had the perfect run in transit but layed in behind them. He may be better suited at this stage of his career out off the rail in more galloping room. ALBURQ (3rd) had the gun run in the box seat, angled three-wide approaching the straight but didn’t run on well enough and had every chance. BRAZEN BRANDO (unplaced) was the real eye-catcher on debut, he was last settling before running on hard between runners in an on-pace dominated race. He had very little room the last furlong and should have finished a lot closer. Race 5: Blue Diamond Preview 1100m Fillies. Notes: CATCH ME (1st) showed her class in a race where she didn’t have a lot go her way. She jumped well but was looking for cover whilst the speedy fillies were going at it up front. At no stage did she get cover, was four-wide approaching the turn and looked to be under pressure. She balanced up well but a swooper out wide levelled up and looked like going right by, but when McEvoy go busy on her, she rolled in a little but was too strong. JEDASTAR (2nd) showed great natural speed, had to work a little to cross to the rail and stuck on well after the swoopers loomed up, kicked back to hold 2nd. SHIH TZOU (3rd) was very good at her debut, she got cover behind the winner in the run, eased off her back and looked like going straight by hem before peaking late. PRETTY BRAZEN (unplaced) had every chance but was a little one-paced, ANAHEED (unplaced) may have finished closer had she got a little more galloping room in behind the leader. Race 6: 3YO BM78 Handicap 1400m. SOCIAL SPIN (1st) had to lump the 60kg and he go no favours in doing so. He jumped ok but was stuck three-wide without cover, loomed up a length away at the top of the straight and put them away in a classy return after a month break. Notes: STAROUZ (2nd) was the only other runner that you would want to be following out of the race. He had a nice run in transit before being tightened for room back near the inside and then ran on well over the last 100m when finally clear. MAGNOSSIVA (3rd) sat outside the leader, got the better of that horse early in the straight but was no match for the winner. GOLDIFOX (unplaced) was well in the market, had the back of the winner throughout but just no match in the run home and had every chance. MARSTON (unplaced) had a soft lead but found very little in the run home and was headed early in the straight. Notes: TARQUIN (1st) had the perfect run in transit and was well ridden, settling third and easing three-wide when the runs came, he was always travelling like the winner. He hit the front early in the straight, fought on well and was too good. AL GALAYEL (2nd) had the winners back throughout, every chance but just not good enough in the run home. BONDEIGER (3rd) was huge odds, was well back in the run before saving ground at the turn, hooked to the outside and charged home late. KIWIA (unplaced) was under pressure a long way out but was responding to the rider and didn’t have a lot of room late and probably should have finished closer. VENGUER MASQUE (unplaced) led and was very one-paced having every chance. LAMBORGHINI (unplaced) was snagged back to last and not given much chance the way the race was run. He was very wide and a little all over the shop in the straight, forgive him that run as it certainly wasn’t run to suit. For those that went one out with the odds-on pop SILENTZ (1st) in the Quaddie, it was an easy watch. The 5YO gelding wasn’t perfectly ridden, settling in the box seat before easing three-wide and joining in quickly at the top of the straight. He kept going to the line and never really looked like getting run down at any stage. All honours. Notes: GUIZOT (2nd) was a bit slow out but had the right run after getting the back of the winner when he made his run, ran on well but was no match for the shortie. EMPEROR’S WAY (3rd) also had every chance after racing inside the winner mid-race, eased around them but didn’t run on well enough after the soft run. COOL CHAP (unplaced) should have finished a lot closer after not having much room in the straight, he will strip fitter for the run second-up and will be winning soon. MAGNAPAL (unplaced) and WENNER (unplaced) were the first two in running at the 400m mark but finished last and second last. Race 9: John Dillon Stakes 1400m. As easy the watch was for the favourite backers in the last race, those that had a ticket with the name MANOLO BLAHNIQ (2nd) on it were feeling sick as they headed for the turnstiles on the way home. The bay gelding was quietly ridden and was all but last at the top of the straight. Dunn elected to ride for luck, he was bolting when he ran into a wall of horses, almost sitting up on him as he couldn’t get a run. He finally got an inside run and charged through over the last 50m. He was probably the stiffest runner of the day. Stick with him, he is flying. Notes: All honours with the winner ROCK ‘N’ GOLD (1st) though and in particular the brilliant ride by Damian Lane. After beginning fairly, he was stuck very wide before assessing the situation and seeing the pace was only moderate, whipped around them very wide and took up the running. He kicked clear at the top of the straight and whilst those that were tiring behind him and holding up the unlucky runner-up, he found a winning break and was too good. CHAMOIS ROAD (3rd) had every chance, THEANSWERMYFRIEND (unplaced) did way too much wrong, after beginning poorly he had to work to get on the speed, pulled his head off throughout and found very little late. He was expected to be the leader so may have lost it at the start. ARBEITSAM (unplaced) jumped well but for some reason didn’t want to lead and had every chance after racing on the speed.